This week was very, very cramped. First we spent the long weekend picking furniture and spying on Usagi the typhoon, then when week started with Usagi left, most time I can spare was spent on wedding preparation. Wine picking, gowns and suits fitting, church booking confirmation, invitation drafting and guest list updating... Mr. A is as supportive as he can be, but sometimes, I just can't handle myself. :( Working and prayer hard that the coming weeks can be bearable and smooth. Popped into a few Sasa stores when I was in between appointments, or as tea breaks between errand A and errand B. How original (!)... One trip brought me to purchase a K Palette Lasting Eyebrow "01" $55 and a Cyber Colors Powder Eyebrow Pencil "Light Brown 04" $52. Although I have 5 back-ups of my all time favourite brow pencil from Naris Up - link! - I am still panicking that when those run out, like 10 years later, I will have no more brow pencils I can use. These are slightly more pricey than my favourite Naris Up one, but still pretty affordable. Both of these have the colour I want, a neutral slightly golden ash brown; I can actually swatch these in store before I purchase, probably as they are the more expensive ones? Texture is so far so good, and the brush/spooly at the end are nice. Most importantly? The lids on both ends are still intact after a week dwelling in my make up bag, unlike this bad monster - link! - or the Excel Eyebrow - link! - those lids don't stay! may I be admitted to a brow pencil - hand cream - hoarding - rehab? Their Radiant Creamy Concealer $260 is all hyped up everywhere so one day, stressed out as I am every day now, before we went wine procurement, I stopped by the Nars counter and picked these up. In terms of depth or darkness of colour, Vanilla seem to match me the best, however it does come in a pinkish tone which I don't want all over my face (and it was out of stock). So I opted for a slightly darker 'Custard' and slightly paler 'Chantilly', both yellow tone and blended together, match me perfectly. This was my first time buying Nars over the counter and honestly, I find their sales'/artists' personality a little too strong for my taste. Indeed they do and sell make up well, but compared to MAC staff, they are a little rude, (to me at least?). Finally, yeah, finally, I was invited to a skin care treatment at Shiseido, trying out a whole range of White Lucent products, from cleansing to mask to emulsion, that is like a ten step routine. The experience was well and I picked up the White Lucent Brightening Toning Lotion Cool $350, which helps with pores and firming (plan to use this around my nose and on my cheeks), White Lucent Brightening Cleansing Gel $240 (because my cleanser stash just like to grow), and a packet of Shiseido Facial Cotton $50 (for 165 pc), which is incredibly soft. As gifts I received White Lucent Power Brightening Mask (costs about $100), White Lucent Brightening Cleansing Foam w, day and night Emulsions, and the Softener. | Book Fair Acquisitions | there are so much non-literature items hauled back! For the longest time this spray bottle has been idled in my bathroom cupboard. In the past I tend to use my Dr. Bronners to deep clean all my brushes, natural or synthetic bristles, expensive or cheap brushes. Not only is this deep clean method very time consuming, requires standing/bending over the sink for a long time, but also it hurts my already very dry hands (probably need to get rubber gloves to do this chore). However, this week I dug out my Clinique cleanser and an old dish cloth, sit by my desk and spray-swirl all my dirty brushes on the cloth. This way I can make sure all the make up come off, and sit comfortably watching youtube while doing so. The cleanser says rinsing with water is necessary so I then bring all my brushes to the sink and give them a quick rinse. That took me at least half the time and double the comfort. Very happy to find a new way to enjoy cleaning my brushes and to use up this bottle of cleanser! 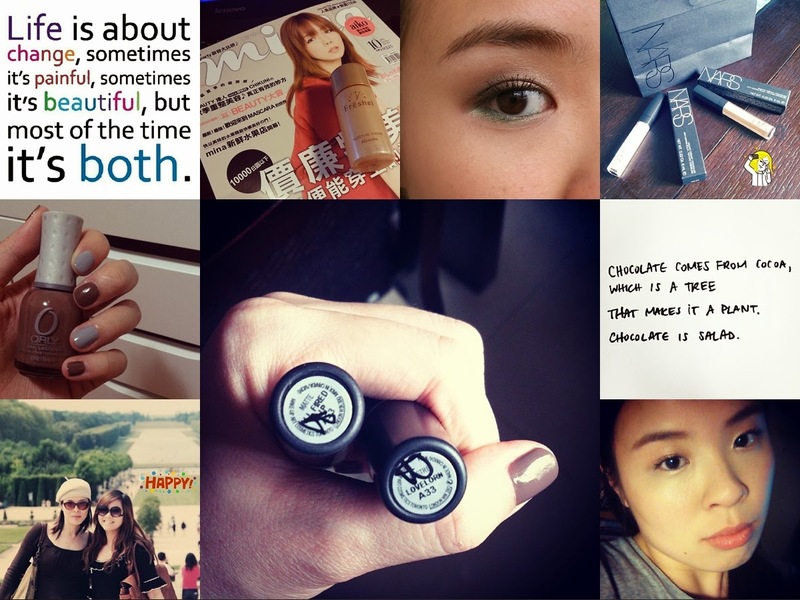 If you're interested in beauty blogging, visit Erin's page - link! - where she consolidated a lot of good tips and sharing on her experience. Pick up one or two idea each time, and you will probably be the next big beauty blogger as successful as she is! I am seriously looking forward to a better week and month. How was your past week? I like the simple look of the blog. You would do an inventory of products for eyebrows? would be good to see them all together. I'm not going to buy stuff from iHerb for a while, the last package took almost 30 days to arrive.